Ultimate Maps Plugin is the best an alternative to Google Maps. It’s the most complete and user-friendly mapping solution for WordPress. Customization and settings are so easy! Let’s look the main steps in your map creation. In WordPress, navigate to Plugins -> Add New. Search for “Ultimate Maps” and click install. When the installation has been completed click “Activate Plugin”. You will have a new admin menu item titled “Ultimate Maps”. After you’ve got your plugin installed, it’s highly recommended to add your own API keys for Mapbox, Thunderforest, Bing Maps to settings in order to prevent errors, when page can’t load Maps correctly. To avoid this, you should go to Ultimate Maps plugin settings and find there “User API key” point. If you already have your API key, then just insert it in the form. On the left navigation menu click “Add Map”. Enter the name of map. All detailed info about Maps properties settings you can find here. Don’t forget to press the “Save map” button after you change the map settings. Click “Add New Marker” button – in the center of the map will appear a marker. Set the name of marker. Set the address of the marker – start typing and then choose the address from the list. Or you can just click on a point on the map. When you have’ve created the marker on the Marker Tab, scroll down till you find Markers Category, set the one you created for current marker and click Save Marker button. You have ability to add shapes to the map, with a help of which you can highlight the certain area. Shape Name – the title of your figure. Set the colors for lines and fill, Opacity, Line Weight. Draw the shape. With Poly-line type you can create a series of straight segments on the map. With Polygon type you can choose the certain area enclosed by a closed path (or loop), which is defined by a series of coordinates. With Circle type you can create round figure with different size and opacity to mark the area you need. Create multiple shapes for one map. Edit shapes that were been created before. Remove the shape from the map. On the left navigation menu click “Maps Import / Export”. Here you can export or import maps and markers. To export maps or markers – click “Export” button and “Maps from Ultimate WordPress Plugin.csv” or “Markers from Ultimate WordPress Plugin.csv” file will be downloaded on your computer. 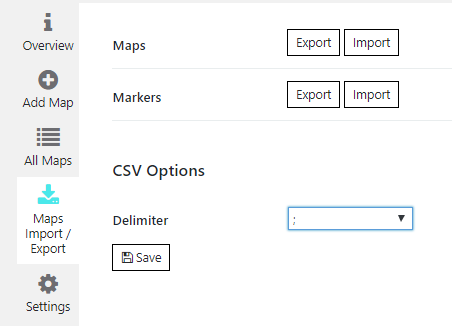 To import maps or markers – you need to click “Import” button and choose the .csv file. In general php code can be inserted at any place of the page code – in order to display exactly in this place, for example in the header or footer of the page. Besides it can be inserted in the code of template of the theme – to display on all pages. You can find PHP code and shortcode in dropdown list above the plugin tabs.